All white blood cells have nuclei, which distinguishes them from the other blood cells, the anucleated red blood cells (RBCs) and platelets. Types of white blood cells can be classified in standard ways. Two pairs of broadest categories classify them either by structure (granulocytes or agranulocytes) or by cell lineage (myeloid cells or lymphoid cells). These broadest categories can be further divided into the five main types: neutrophils, eosinophils (acidophiles), basophils, lymphocytes, and monocytes. These types are distinguished by their physical and functional characteristics. Monocytes and neutrophils are phagocytic. Further subtypes can be classified; for example, among lymphocytes, there are B cells, T cells, and NK cells. The name “white blood cell” derives from the physical appearance of a blood sample after centrifugation. White cells are found in the buffy coat, a thin, typically white layer of nucleated cells between the sedimented red blood cells and the blood plasma. The scientific term leukocyte directly reflects its description. It is derived from the Greekroots leuk- meaning “white” and cyt- meaning “cell”. The buffy coat may sometimes be green if there are large amounts of neutrophils in the sample, due to the heme-containing enzyme myeloperoxidase that they produce. They excrete two chemicals that aid in the body’s defenses: histamine and heparin. Histamine is responsible for widening blood vessels and increasing the flow of blood to injured tissue. It also makes blood vessels more permeable so neutrophils and clotting proteins can get into connective tissue more easily. Heparin is an anticoagulant that inhibits blood clotting and promotes the movement of white blood cells into an area. Basophils can also release chemical signals that attract eosinophils and neutrophils to an infection site. CD4+ helper T cells: T cells displaying co-receptor CD4 are known as CD4+ T cells. These cells have T-cell receptors and CD4 molecules that, in combination, bind antigenic peptides presented on major histocompatibility complex (MHC) class II molecules on antigen-presenting cells. Helper T cells make cytokines and perform other functions that help coordinate the immune response. In HIV infection, these T cells are the main index to identify the individual’s immune system integrity. 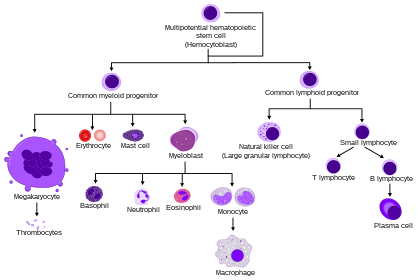 Monocytes, the largest type of WBCs, share the “vacuum cleaner” (phagocytosis) function of neutrophils, but are much longer lived as they have an extra role: they present pieces of pathogens to T cells so that the pathogens may be recognized again and killed. This causes an antibody response to be mounted. Monocytes eventually leave the bloodstream and become tissue macrophages, which remove dead cell debris as well as attack microorganisms. Neither dead cell debris nor attacking microorganisms can be dealt with effectively by the neutrophils. Unlike neutrophils, monocytes are able to replace their lysosomal contents and are thought to have a much longer active life. They have the kidney shaped nucleus and are typically agranulated. They also possess abundant cytoplasm. Defined as total lymphocyte count below 1.0×109/L, the cells most commonly affected are CD4+ T cells. Like neutropenia, lymphocytopenia may be acquired or intrinsic and there are many causes. This is not a complete list. ^ LaFleur-Brooks M (2008). Exploring Medical Language: A Student-Directed Approach (7th ed.). St. Louis, Missouri, US: Mosby Elsevier. p. 398. ISBN 978-0-323-04950-4. ^ “Vital and Health Statistics Series 11, No. 247 (03/2005)” (PDF). Retrieved 2014-02-02. Alberts B, Johnson A, Lewis M, Raff M, Roberts K, Walter P (2002). “Leukocyte also known as macrophagesfunctions and percentage breakdown”. Molecular Biology of the Cell (4th ed.). New York: Garland Science. ISBN 0-8153-4072-9. ^ “Medical gallery of Blausen Medical 2014″. WikiJournal of Medicine. 1 (2). doi:10.15347/wjm/2014.010. ^ Orkin SH, Zon LI (February 2008). “SnapShot: hematopoiesis”. Cell. 132 (4): 712. doi:10.1016/j.cell.2008.02.013. PMID 18295585. Daniels VG, Wheater PR, Burkitt HG (1979). Functional histology: A text and colour atlas. Edinburgh: Churchill Livingstone. ISBN 0-443-01657-7. ^ Handin RI, Lux SE, Stossel TP (2003). Blood: Principles and Practice of Hematology (2nd ed.). Philadelphia: Lippincott Williams and Wilkins. p. 471. ISBN 9780781719933. Retrieved 2013-06-18. Saladin K (2012). Anatomy and Physiology: the Unit of Form and Function(6 ed.). New York: McGraw Hill. ISBN 978-0-07-337825-1. ^ Wheater PR, Stevens A (2002). Wheater’s basic histopathology: a colour atlas and text (PDF). Edinburgh: Churchill Livingstone. ISBN 0-443-07001-6. ^ Pillay J, den Braber I, Vrisekoop N, Kwast LM, de Boer RJ, Borghans JA, Tesselaar K, Koenderman L (July 2010). “In vivo labeling with 2H2O reveals a human neutrophil lifespan of 5.4 days”. Blood. 116 (4): 625–7. doi:10.1182/blood-2010-01-259028. PMID 20410504. ^ Falcone FH, Haas H, Gibbs BF (December 2000). “The human basophil: a new appreciation of its role in immune responses”. Blood. 96 (13): 4028–38. PMID 11110670. Kumar V, et al. (2010). Robbins and Cotran pathologic basis of disease(8th ed.). Philadelphia, PA: Saunders/Elsevier. ISBN 1416031219. Kaushansky K, et al., eds. (2010). Williams hematology (8th ed.). New York: McGraw-Hill Medical. ISBN 978-0-07-162151-9. ^ McPherson RA, Pincus MR, Abraham NZ, et al. (eds.). Henry’s clinical diagnosis and management by laboratory methods (22nd ed.). Philadelphia, PA: Elsevier/Saunders. ISBN 1437709745. Goldman L, Schafer AI (eds.). Goldman’s Cecil medicine (24th ed.). Philadelphia: Elsevier/Saunders. ISBN 1437716040. ^ McBride JA, Dacie JV, Shapley R (February 1968). “The effect of splenectomy on the leucocyte count”. British Journal of Haematology. 14 (2): 225–31. doi:10.1111/j.1365-2141.1968.tb01489.x. PMID 5635603.